Dr Jenni Bauquier has given many thousands of injections as a vet with the University of Melbourne’s U-Vet Equine Centre. Jenni offers her knowledge on how to make this simple procedure as safe and stress-free as possible. The most common scenarios in which owners will be involved with giving injections is when their horse has been prescribed a course of medication, such as penicillin, or if owners are purchasing vaccines directly from produce stores. Intramuscular (IM): Injecting medications into the muscle is a very common route of administration and this is the only place owners will routinely be injecting. Because muscles are full of lovely blood vessels designed to supply exercising muscle, they’re also great for depositing things like medications. Those same arteries that supply oxygen to the muscle also conveniently courier medications around the body. Subcutaneous (SC): These injections involve placing the medication just under the skin into an area filled with the loose connective tissue that separates the skin and muscle. Think of the subcutaneous layer as the white pith that sits between the skin and the flesh of an orange. In horses, this is not a common route for injections to be given and your vet will be able to direct you on how to do it, should the need arise. Intravenous (IV): Injections into veins, which place medication directly into the bloodstream, are also commonly administered by vets. However, IV injections should not be carried out by owners (under most circumstances), as complications occur more commonly and can be more severe compared to other locations for injections. IV injections can also get bloody very quickly - definitely not for the squeamish. It’s important you only give injections if you feel comfortable and you know what you’re doing. If you don’t feel confident, it’s best to seek assistance from someone with more experience. There’s only so much advice a magazine article can provide! If you don’t feel comfortable, you’ll get stressed, the horse will get stressed, things are more likely to go wrong and a simple procedure can become a real saga. If you have a needle-shy horse, it can be good to get an experienced equine behaviourist in to help tackle this issue safely in the long-term. The British Equine Vets Association has recently released a series of excellent educational videos for horse owners that demonstrate how to train and re-train your horse to allow for common treatments, including injections. The hyperlink to the whole Don't Break Your Vet video series by BEVA is: http://bit.ly/2BgX0tk or search for BEVA’s YouTube Channel. IMAGE A: Learn your horse's body landmarks, so you can inject into a major muscle, and stay clear of bones and ligaments. The landmarks marked in yellow on the rump are 1. point of the croup (tuber sacrale), 2. point of the buttock (tuber ischii). 3. hip bone (tuber coxae) and 4. top of the tail. Artwork by Cristina Wilkins, Horses and People. 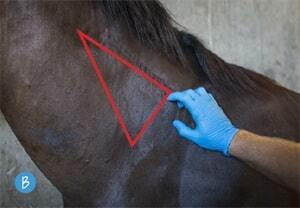 IMAGE B: If it helps, draw the target area on the horse's coat, and remember, near the horse's shoulder, the neck vertebrae are in the lower half of the neck. Photo by Linda Zupanc, Horses and People. Ideally, a confident handler to hold the horse. You’re much better off with someone holding the horse and standing on the same side as you than tying the horse up. It’s crucial you don’t inject your horse without first knowing where to go and how to get there. There are two major destinations on your horse for you to choose from: the neck and the rump. Don’t pick one at random – answer this one simple question to find out which one is right for your horse! Q: Is this a once-off injection? Or, will you be needing to give your horse several injections in a short space of time, for example, a twice-a-day for five-days course of penicillin? It’s just one vaccination. Lucky you! You only have to give one injection! Go for the neck, it’s slightly safer and easier. It’s a course of injections. Lucky you! Think of all the injecting practice you’ll get! You’ll likely need to give injections into both the neck and the rump. Why? Because, just like when you get your flu shots, the horse will have some degree of discomfort at the site of an injection. So, even if it’s only a short course of injections, be kind and don’t stick another needle in the same spot right away – rotate! If you have to give two injections a day, work from front to back, doing the neck one day and the rump the next. Jenni suggests being guided by the rhyme ‘right at night’. Step 3: Know your landmarks! Now you’ve chosen your destination, grab your comfy walking shoes and join us for Lonely Planet’s guide to equine injection sites. This is a good site for injecting because there’s plenty of muscle and you’re a healthy distance from the danger zone of your horse’s hind legs. Plus, being near the horse’s head means that both, you and your handler will be able to read your horse’s body language a little better. However, frightened horses are extraordinarily agile with all parts of their bodies - their hindquarters and their teeth – so a healthy level of awareness and caution must always be exercised. At the neck, there are three exciting landmarks for you to observe, which form a visual triangle (see Image A). The bottom of the triangle is formed by the part of the spine that travels through the horse’s neck - the cervical vertebrae. Do not be fooled! The cervical vertebrae are lower than your instinct would lead you to believe. Jenni says this is what catches people out the most. The vertebrae are in the thickest part of the horse’s neck and, unless you have a very chubby pony, you should be able to feel the vertebrae if you press your fingers firmly into the lower part of your horse’s neck. The side of the triangle is formed by the shoulder blade, or scapula. This should be relatively easy to find. If you need a guide, first locate the point of the shoulder and trace it upwards towards the front of the horse's wither. The top of the triangle is the nuchal ligament that joins the wither to the horse’s poll. This is the wide ligament that sits below the mane. If you inject too far towards the horse’s mane, you will end up in the nuchal ligament. This is problematic because there aren't enough blood vessels in a ligament to absorb medications effectively. There's also an increased risk of infection and neck pain or stiffness post-injection. Be especially vigilant when you’re down this end – you’re now well and truly in premium striking territory, so be very aware of the horse’s behaviour. As always, stand nice and close to the horse, just in front of their hind leg. The closer you stand, the less momentum the horse can work up to propel you into the twenty-second century, should he take fright. The rump has a bonus landmark, i.e. there’s a total of four clear parts of the anatomy to familiarise yourself with - all of which should feel like bony lumps when you push on them. If your horse has a slightly dusty or Winter coat, you can use it as a canvas and trace the area between the landmarks, so you get a nice, obvious target to aim for (but you also don't want to be injecting through large amounts of dirt, so try and find a balance). Landmark 1: the tuber sacrale (commonly known as the point of the croup). This is the highest bony point on the midline of the horse’s rump. Landmark 2: the tuber ischii (commonly known as the point of the buttock). This is the bony protuberance you can feel if you drop down about 30cm from the base of the tail. Landmark 3: the tuber coxae (commonly known as the point of the hip). This is the bony protuberance that you get if you drop about 30cm down, and a little forward, of the tuber sacrale. Landmark 4: the top of the tail. A nice, self-explanatory one. (See image A) - imagine a line running from the top of the to the tuber coxae, and another one running from the tuber sacrale to the tuber ischii. Inject where the two lines intersect. Be careful not to touch the metal part of the needle or the end of the syringe, as these should remain sterile. If your needle and syringe are not already connected, connect them now so you can draw up the medication. Also be careful not to stab yourself! Amongst other reasons, it hurts like hell. Double check you take up the quantity prescribed by your vet. Ideally, you should safely discard the needle that was used to draw up the medication and use a fresh one for injecting into the horse. This will maximise sterility, and ensure the needle is as sharp as possible for getting through the thick skin. Despite popular belief, it isn’t necessary to do a particularly good job of cleaning the injection site. Removing any especially gross dirt with a brush is all that’s needed. The reason behind this is that a single alcohol swab is ineffective and a full surgical prep, which might take 15 minutes, is overkill and not practical for most owners. What is important is to remember it’s always one needle per injection per horse, then discard it and the syringe. Do not skimp on needles and syringes. Step 6: It’s time for the injection! If you’re injecting the neck, pinch a fold of skin just in front of where you’re injecting and then, as smoothly and as quickly as possible, insert the needle into the muscle up to the hub (the plastic part of the needle). It’s thought that pinching the skin helps to desensitise the area prior to the insertion of the needle. When pushing the needle in, fast and smooth is better, because getting through the first layer of skin hurts the most. If you’re injecting into the rump, Jenni suggests the ‘tap, tap, jab’ technique. Hold the needle between your thumb and index finger, and then use the bottom of your fist to tap the injection site before inserting the needle. The theory is, this way, the horse is given some warning before they’re jabbed. Attach the syringe to the needle which is now in the muscle. Once they are firmly connected, draw back hard on the syringe! This step is crucially important because you need to make sure you’re not in a blood vessel – bad and dramatic things can happen if medications that are supposed to be going into muscle end up in a blood vessel, especially penicillin. You must ensure you’re looking for blood at the junction between the needle and syringe. If there’s resistance when you draw back and no blood, then go ahead and give the injection. If blood appears in the needle hub, pull the needle back slightly within the muscle (do not remove it completely) and redirect it. Draw back again to ensure your new position isn’t in a vessel and, if no blood appears, go ahead and give the injection. For a 500kg horse, you should not inject more than about 30mL into one site. If you’re giving a volume larger than this, your vet will advise you on how to give it in multiple locations. Make sure you reward your horse immediately afterwards with a scratch and a bit of carrot, apple or another favourite treat. It’s important to end positively as it makes the experience more pleasant for you and your horse. For safe sharps disposal, keep used needles in a hard plastic container and take them to your vet, or give them to your vet at the next visit. Needles should not be disposed of with general rubbish. Just like when you’ve had the extreme pleasure of the flu vaccine, it is normal for the horse to experience a bit of tenderness at the site of an injection. However, Jenni advises if the injection site is painful enough to be affecting the horse’s movement or demeanour, you must contact your vet as abscesses and other reactions can sometimes occur. It is not uncommon for horses to have an excitatory reaction to a component of the penicillin injection. The reaction can be dramatic, spectacular and scary, but normally self-resolves. An anaphylactic reaction is very rare. Stay aware of your horse’s behaviour at all times and, if anything concerns you, make the situation safe for yourself and get in touch with your vet as soon as possible. And, there you have it – worry-free intramuscular injections in nine steps! The most common mistakes clients make are; getting the landmarks wrong (particularly the location of the neck vertebrae) and not drawing back before giving the injection to check the medication goes into the muscle and not directly into a blood vessel. Always ask your vet if you are in doubt. There are multiple slight variations on how to give an intramuscular injection, so don’t be surprised if you see your vet do it slightly differently. Overall, injecting your horse should be a relatively simple procedure!